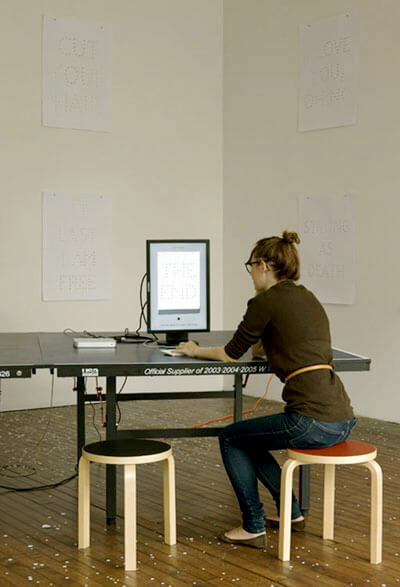 The work of Jürg Lehni and Alex Rich (born 1978 / 1977, live in London and Penarth) playfully addresses the development of printing technology, as well as the interface between machine and user. 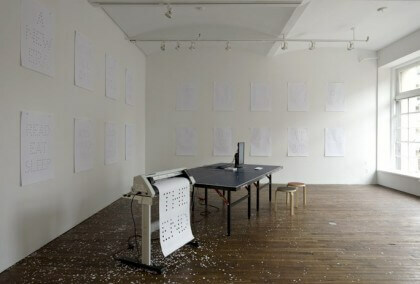 In Empty Words (2009), a plotter punches characters into paper, mechanically visualizing the artists’ favorite song titles. The sheets are installed as a narrative panorama on the gallery walls. Visitors are invited to produce their own artworks and to find the balance between auto-manifestation and technological constraint.